Learn more tips and techniques about Whiteboard from SMART Technologies. The use of interactive whiteboards has become common place in many school classrooms and training rooms. 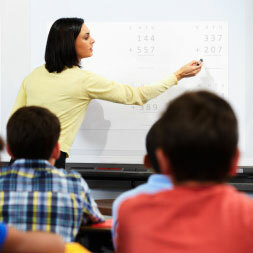 Interactive whiteboards give teachers and trainers an enormous capability in terms of the type of teaching techniques they can engage in and the kind of materials they can present as part of their teaching programs. One advantage of interactive whiteboards is that they allow a teacher to prepare lessons in advance and the SMART Technologies application provides a number of templates to help with this. This SMART Technologies course follows on from our Introduction to Using Whiteboards course and goes into much more detail about the use of the Lesson Activity Toolkit and also gives the learner useful tips and techniques to help with editing and using the application. You will be shown examples of the different templates from image sequencing and matching to timelines and anagrams, and where there is flexibility in the use of an activity such as using the timeline for more than dates. The course also provides tips on editing and managing the objects and text on the pages as well as showing you how to use the Paperclip feature to quickly access resources and the camera to capture information from the Web. This SMART Technologies course will be of great interest to teachers and trainers looking to make full use of the flexibility, interactivity and student participation allowed by an interactive whiteboard within the classroom or training room, and to all learners who would like to learn more about the functionality of interactive whiteboards within an educational setting.